From the 17th to 19th century the main political entity in the area of central present-day Benin was the Kingdom of Dahomey, a military power in the region and an active participant in the trans-Atlantic slave trade. This contact with the New World has made a lasting contribution to Benin’s culture. The Kingdom of Dahomey, and the city-state of Porto-Novo on the coast, were incorporated in the colony of French Dahomey in 1894. Independence from France was won as the country of Dahomey in 1960, after which was a period of civil and military unrest, culminating in the proclamation of a Marxist-Leninist state in 1975, when the country was renamed the People’s Republic of Benin. A change to multi-party democratic political system in 1991 saw the country officially renamed the Republic of Benin. Benin’s economy is heavily dependent on agriculture. Most of the population is employed in subsistence agriculture, and commercial agriculture for export is a key contributor to the economy, particularly cotton, which accounts for around 40% of GDP and 80% of official export receipts. Other agricultural products are also important economically, including wood. The service sector is the largest single contributor to GDP, driven by trade and transportation links with neighbouring countries, and tourism. Petrochemical exports were significant in the 1980s, when offshore reserves were extracted, but these operations declined in the 1990s, although Benin is exploring the possibility of revamping petrochemical production post 2020. Average annual rainfall in Benin is relatively high, but varies considerably by season as well as across the country. The south of Benin, in particular, has good surface water resources in perennial rivers, but groundwater is widely used across the country in rural and urban areas for domestic water supply. The capital Cotonou depends extensively on groundwater. Aquastat figures (see below) show relatively high rates of access to improved water sources, but Benin government figures, which use a different definition of access, show much lower rates: 57% in urban areas and 55% in rural areas in 2009. Please cite this page as: Boukari, Totin, Upton, Ó Dochartaigh and Bellwood-Howard, 2018. Benin extends from the Atlantic Ocean (Gulf of Guinea) in the south to the Niger River in the north, a distance of around 700 km. The country is relatively flat, with a granitic plateau in the centre of the country which rises to the Atakora mountain range in the north-west. The highest point is at an elevation of 658 m above sea level. The majority of the country is classified as a tropical savannah climate, apart from the far north, which transitions into a hot and arid climate towards the Sahel region. Average annual rainfall across the majority of the country is between 1000 and 1100 mm. This decreases in the northern zone to almost 700 mm per year. Average temperatures also show a north-south transition, increasing by a relatively small amount towards the north. There are temporal changes in precipitation and temperature throughout the year. The principal rainy season occurs between April and August, and a second, shorter and less intense rainy season occurs during September and October. 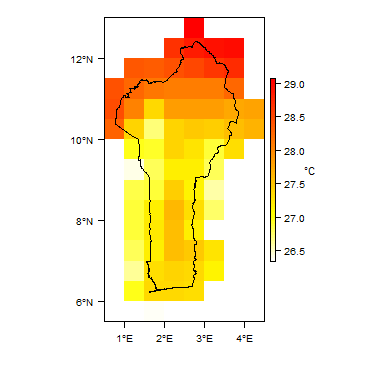 More information on average rainfall and temperature for each individual climate zone can be found on the Benin climate page. The main rivers in the north of Benin are tributaries of the Niger River, and flow northwards, out of the country. The main perennial river in the south of Benin is the Oueme River, which, along with some other smaller rivers, drains into the network of lagoons which has developed along the coast – there is no natural river discharge directly into the Atlantic Ocean. The General Directorate of Water (DG-Eau) maintains 48 river flow gauging stations across Benin. Records cover the period 1950–2014, with daily observations. River flow data are stored in the Department of Water Information within the DG-Eau. The Early Warning System (SAP) project also collects river flow data. Lixosols are the dominant soil type in Benin, reflecting stable geological conditions, a savannah climate and grassland vegetation. Leptosols are found in the mountainous region in the north-west of the country while arenosols (large sand deposits) occur in the Sahel region along the north-eastern border. Productive nitisols have developed on the alluvium in the coastal region. On the sandbars and lagoons of the coastal region are gleysols and arenosols. This section provides a summary of the geology of Benin. More detail can be found in the references listed at the bottom of this page. Many of these references can be accessed through the Africa Groundwater Literature Archive. The geology map on this page shows a simplified version of the geology of Benin at a national scale, based on 1:5 000 000 scale mapping (see the Geology resource page for more details). A more detailed geological map at 1:200 000 scale was produced by BRGM (1978). Alluvium Quaternary Sand, clay, silt and sometimes gravel deposits, forming outwash fan, channel and floodplain deposits along river channels. Variable thickness but generally less than 100 m.
Benin Sedimentary Coastal Basin Lower Cretaceous–Quaternary Marine deposits (sandstone, limestone, clay, marl and conglomerate) belonging to the Keta Basin, deposited along the Atlantic coast of Ghana, Togo, Benin and Nigeria. Fine-grained unconsolidated lacustrine sediments are also deposited along the coast. Marine deposits have highly variable thickness (10–2000 m). Unconsolidated coastal deposits are on average 50 m thick. Were, Goungoun, Kandi, Sende & Continental Terminal formations Lower Palaeozoic–Cretaceous Conglomerate, sandstone, siltstone and clay. These continental deposits, belonging to the southern part of the Iullemeden Basin, also occur in Nigeria, Niger and Mali. Variable thickness (20–400 m). The Continental Terminal Formation contains small extensional features. Voltaian (or Pendjari) Basin Late Precambrian–Lower Palaeozoic Sandstones, shales and siltstones. Highly variable thickness. Buem (volcanic-sedimentary) Series Late Precambrian Sandstone, quartzite, rhyolite and andesite Highly variable thickness (estimated 250–2000 m). Basement Complex Precambrian Crystalline gneiss and granulite with granite and syenite intrusions. Highly metamorphosed and deformed during several orogenic phases which gave rise to various episodes of igneous activity. Often intensely folded. Folds are generally isoclinal. Not generally steeply dipping. Atacora, Kande and Kouande series Precambrian Quartzite and schist. Highly metamorphosed during the Panafrican Orogeny. 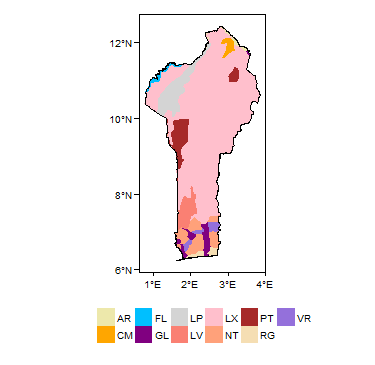 This section provides a summary of the hydrogeology of the main aquifers in Benin. More information is available in the references listed at the bottom of this page, many of which can be accessed through the Africa Groundwater Literature Archive. 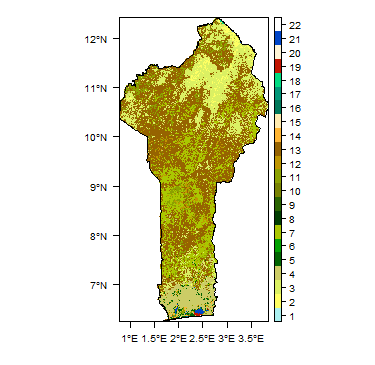 The hydrogeology map on this page shows a simplified version of the type and productivity of aquifers in Benin, at 1:5 000 000 scale (see the Hydrogeology map resource page for more details). More detailed hydrogeological maps, at 1:500 000 scale and 1:200 000 scale, are produced by GIZ Germany/DGEau Benin (Achidi et al., 2012). Alluvial and barrier beach deposits The alluvial and barrier beach deposits of Benin are highly variable both laterally and vertically. The alluvial deposits are found along the major river valleys, the most significant of which is the River Niger valley in the north. The barrier beach deposits are found along the coast and are dominated by relatively impermeable clays. However, interbedded, generally poorly sorted, coarser grained sands and gravels can form aquifers of local importance along the coast. Yields are highly variable but are often reported around 5 l/s, and sometimes higher from sand and gravel layers. Transmissivity is generally 10 to 400 m²/d. Storage coefficient is typically 10-2 to 10-1. 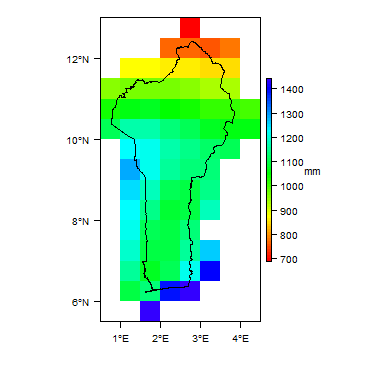 The thickness of the unconsolidated aquifers typically varies between 10 and 20 m. The water table is generally shallow, less than 7 m below ground level. Boreholes are typically drilled to depths of 5 to 20 m.
There are no known issues with water quantity and availability. The unconsolidated deposits are particularly vulnerable to contamination from latrines and agriculture. Saline intrusion is an issue in the littoral area and high salinity is also reported in parts of the alluvial aquifer along the Oueme River valley. Recharge is not well quantified. Coastal sedimentary basin aquifers There are four main aquifers in the Coastal Basin, and they are the main source of drinking water for southern Benin. They are, in order of decreasing age, the Upper Cretaceous, Paleocene, Continental Terminal and Quaternary aquifers. They are separated by low permeability clays and marls, and may be confined or unconfined depending on the local geology. Yields are generally 2 to 50 l/s. Transmissivity is generally 80 to 900 m²/d. Storage coefficient is typically 10-6 to 10-5. The coastal sedimentary aquifers typically range from 20 to 150 m thick, with boreholes extending to depths of 10 to 100 m. Where the aquifers are unconfined, the water table depth may vary from 5 to 50 m below ground level. Storage decreases where aquifer thickness is low (typically towards the upstream limits), which can lead to issues with groundwater availability. Total dissolved solids (TDS) is generally less than 500 mg/l and usually around 200 mg/l. pH is typically neutral to acidic. Saline intrusion is an issue in the littoral zone. Unconfined aquifers are particularly vulnerable to contamination from latrines and agriculture, especially where the water table is very shallow. Recharge is not well quantified. Kandi Basin (Iullemeden) aquifer and Voltaian (or Pendjari) Basin aquifer The Kandi Basin can be divided into two principal aquifers: a younger Cretaceous sandstone aquifer, and an underlying Cambro-Ordivician sandstone aquifer. The two aquifers are separated by low permeability fine sandstones and argillites of Silurian age. The Cretaceous aquifer comprises coarse sandstone; groundwater is unconfined and in hydraulic continuity with overlying unconsolidated alluvial deposits along the Niger River. The underlying Cambro-Ordovician aquifer is also composed of coarse sandstone and is largely confined. It becomes unconfined in the south and west of the basin where the sandstone outcrops adjacent to Precambrian basement. The Voltaian Basin aquifer has similar regional characteristics to the aquifers in the Kandi Basin. Yields are rarely higher than 1.5 l/s. Transmissivity varies from <1 to >600 m²/d. The total thickness of these aquifers is unknown. Boreholes typically vary in depth from 30 to 100 m. Where unconfined, the depth of the water table varies between 5 and 45 m below ground level. There are no known issues with water quantity and availability. Conductivity, and thus total dissolved solids, is generally lower for the unconfined Cretaceous aquifer with values of 25–60 microsiemens per cm reported for the upper aquifer and 130–425 microsiemens per cm reported for the lower aquifer. Recharge is not well quantified. Basement Complex Sandstone (central Benin) and Atacora Series (north-west Benin) Basement aquifers have very low intergranular permeability in their unweathered state. Aquifer productivity depends on the development of a weathered zone. Coarser-grained granites and gneiss generally weather to a more permeable sandy material which typically forms a low to moderate productivity aquifer. Weathered areas typically form shallow basins separated by largely unweathered rock. The presence and thickness of the weathered zone is highly variable, but is best developed on plateaus (often 10 to 30 m thick). Weathered basins typically thin towards outcropping inselbergs. Yields are generally 0.25 to 0.5 l/s but can reach 2.0 l/s. Hydraulic conductivity is generally 0.5 to 15 m/d. Tranmissivity is generally 5 to 35 m²/d. Storage coefficient is typically 10-3 to 10-2. The basement aquifers are typically unconfined. Water table depths are generally 5 to 15 m below ground level, but can be deeper (up to 30 m below ground level). Seasonal water table fluctuations are thought to be between 1 and 5 m.
Boreholes are typically drilled to depths of 45 to 60 m.
Boreholes are usually fitted with hand pumps, and therefore abstraction rates are typically low. Total dissolved solids (TDS) is generally less than 1000 mg/l and usually around 500 mg/l. pH is usually neutral to slightly basic. High salinity is occasionally reported. The weathered basement is vulnerable to nitrate contamination from agricultural sources and latrines. Low yields from basement aquifers, which cover most of Benin, lead to difficulties with fresh water availability in medium to large cities. Potable water supply is also an issue in parts of the coastal basin, where the saturated thickness of the shallow aquifers is not sufficient for large supplies. Where the shallow deposits are unable to sustain sufficient yields, boreholes are drilled deeper into the weathered basement below. Groundwater in shallow aquifers is often of poor quality due to contamination. Saline intrusion is a particular problem in the coastal aquifers. In the capital, Cotonou, groundwater is extensively abstracted, but studies have found that groundwater in the urban area contains levels of many contaminants above WHO guidelines, including lead, chromium, cadmium, zinc, coliforms and E.coli (Erah and Akukieze 2002, [https://www.researchgate.net/publication/280839085_Groundwater_pollution_and_the_safe_water_supply_challenge_in_Cotonou_town_Benin_West_Africa Totin et al 2013). The Oueme River loses water to the permeable coastal sedimentary aquifer, and river flow depletion is therefore an issue in this river downstream of the contact between the Precambrian basement aquifer and the coastal sedimentary aquifer. The surface water coastal lagoons around Godomey in central-south Benin often dry up due to intensive pumping from the adjacent Godomey well field. The main uses of groundwater in Benin are domestic supply (both urban and rural), agriculture, livestock and fish farming, tourism, industry and transport. Groundwater sources vary from boreholes with electric pumps, hand pumps and foot pumps, modern and traditional wells, and traditional and improved springs. In 2009 the cost of water borehole drilling in Benin was estimated at an average of 5000 FCFA per metre (about 9 USD per metre) (Bartel et al 2009). National Company of Urban Water Supply (SONEB) - responsible for groundwater supply in urban areas. General Directorate of Water (DG-Eau) - responsible for groundwater supply in rural areas. The "Code of Water in Benin" is the key piece of legislation related to groundwater management. Permits are required for drilling and groundwater abstraction. These are issued by the government through the Ministry of Justice and the Ministry of Water. 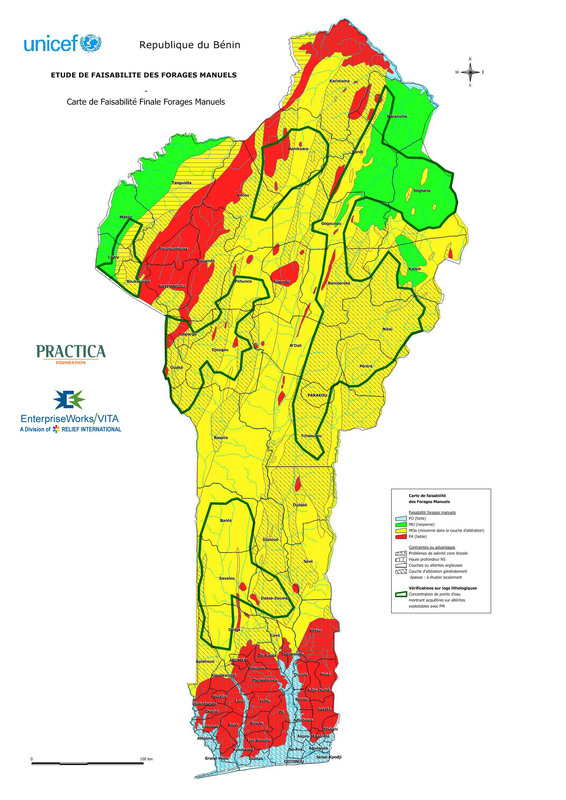 Groundwater protection is very difficult, particularly in more densely populated areas, because the disposal of waste is largely uncontrolled. A water point database exists, with information about more than 15 000 boreholes and wells across the country, although no geological logs are available. Groundwater monitoring is carried out by the National Company of Urban Water Supply (SONEB), the General Directorate of Water (DG-Eau) and the National Institute of Water. The Laboratory of Climatology carries out work to look at climate change impacts on groundwater. In the coastal region the Quaternary and Continental Terminal aquifers are shared with Nigeria, Benin, Togo and Ghana. The aquifers of the Iullemeden Basin are shared with Niger, Mali and Nigeria. The following references provide more information on the geology and hydrogeology of Benin. Affaton, P. 1975. Etude géologique et structurale du Nord-Ouest du Dahomey, du Nord Togo et du Sud-Est de la Haute Volta. Travaux Laboratoire Sciences de la Terre, St-Jérôme, Marseille, France, (B) 201 p.
Alidou, S. 1983. Etude géologique du bassin paléo-mésozoique de Kandi, Nord-Est du Bénin (Afrique de l’Ouest). Thèse de doctorat ès-Sciences, 328 p. Université de Dijon, France. Alidou, S, et Oyédé, L M. 1984. Quaternaire du Bénin. ASEQUA, Dakar. Bulletin de Liaison, 72–73, 42–43. Boussari, W T. 1975. Contribution à l’étude géologique du socle cristallin de la zone mobile Pan-africaine (région central du Dahomey). Thèse de 3ème cycle, 105 p. Université de Besançon, 236. BRGM. 1978. 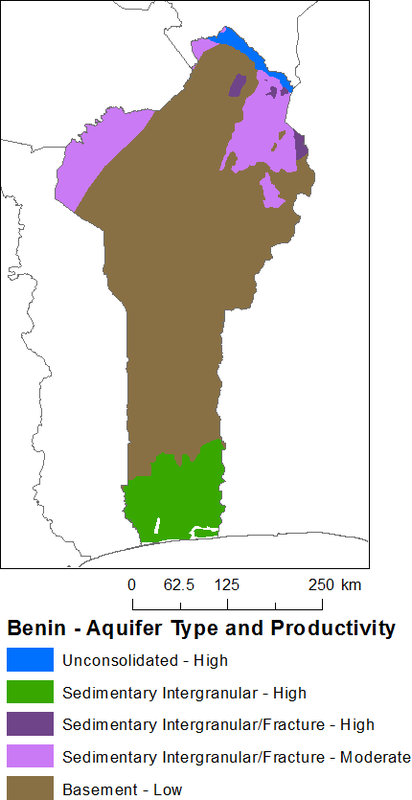 Carte géologique au 1/200 000 du Bénin et du Togo entre les 9ème et 10ème degré de latitude Nord. Rapport, OBEMINES. Cotonou, Bénin. 78 RDM 055 AF. 2 feuilles, 1 notice explicative. Guiraud, R, et Alidou, S. 1981. La faille de Kandi (Bénin), témoin du rejeu fini-Crétacé d’un accident majeur à l’échelle de la plaque africaine. Comptes Rendus Académie des Sciences. Paris, France. 293 (II) 779–782. Houessou, A, et Lang, J. 1979. La "Terre de Barre" dans le Bénin méridional (Afrique de l’Ouest). Bulletin ASEQUA, 56–57, 49–58. IRB ou Istituto recerche Breda. 1982. Etude de cartographie géologique et prospection minière de reconnaissance au Nord du 11ème parallèle. Rapport final OBEMINES, Cotonou, Bénin. IRB ou Istituto recerche Breda. 1987. Etude de cartographie géologique et prospection minière de reconnaissance au Sud du 9ème parallèle. Rapport, 80 p. OBEMINES, Cotonou, Bénin. Konaté, M. 1996. Evolution tectono-sédimentaire du bassin paléozoïque de Kandi (Nord-Bénin et Sud-Niger): un témoin de l’extension post-orogénique de la chaîne panafricaine. Thèse doctorat, 281 p. Université de Bourgogne et Université de Nancy I. France. Konaté, M, Guiraud, M, Alidou, S, Clermonté, J, Drouet, J-J, et Lang, J. 1994. Structuration et dynamique sédimentaire du bassin paléozoïque en demi-graben de Kandi (Bénin, Niger). Comptes Rendus Académie des Sciences. Paris, France. 318 (II) 535–542. Lang, J, Kogbe, C, Alidou, S, Alzouma, K, Bellio,n G, Dubois, D, Houessou, A, et Trichet, J. 1986. Le sidérolithique du Tertiaire oust-africain et le concept du Continental Termial. Bulletin de la Société. Géologique de France, 8 (II), 605–622. Oyédé, L M. 1991. Dynamique sédimentaire actuelle et messages enregistrés dans les séquences quaternaires et néogènes du domaine margino-littoral du Bénin (Afrique de l'Ouest). Thèse de doctorat, 302 p. Université de Bourgogne, Dijon, France. Oyédé, L M, de Klasz, I, de Klasz, S, Lang, J, Carbonnel, G, Grosdidier, E, Legoux, O, et Martini, E. 1992. Datation de la discordance dite «oligocène» sur la partie terrestre du bassin sédimentaire côtier béninois (Afrique de l’Ouest). Comptes Rendus Académie des Sciences. Paris, France. 315(II), 971-977. Pougnet, R. 1955. Le Précambrien du Dahomey. 186 p. Bulletin de la Direction Fédérale des Mines de l’Afrique Occidentale française. Dakar, Sénégal. 22. SERHAU ou Service d’Etude et de Recherche pour l’Habitat et l’Urbanisme. 1992. Atlas cartographique de la région nord du Bénin. Rapport, 54 p. MEHU. Cotonou, Bénin. Slansky, M. 1962. Contribution à l'étude géologique du Bassin sédimentaire côtier du Dahomey et du Togo. Thèse de doctorat, 241 p. Université de Nancy, Nancy, France. TECHNOEXPORT. 1980. La constitution et les substances utiles de la République Populaire du Bénin entre les 10ème et 11ème parallèles de latitude nord. Rapport Office Béninois des Mines. Cotonou, Moscou, Bénin, URSS. TECHNOEXPORT. 1984. La constitution et les substances utiles de la partie Est de la République Populaire du Bénin, entre les 10ème et 11ème parallèles de latitude nord (rapport du levé et de prospection géologiques à l’échelle de 1/200 000 effectués en 1981-1984). Rapport, 331 p. Office Béninois des Mines. Cotonou, Bénin. Wakuti, K E, et Gall, K G. 1968. Reconnaissance géophysique et sondages mécaniques dans le Centre, Nord-Est et Nord-Ouest du Dahomey. Rapport Direction Hydraulique, Mines et Travaux Publics. Cotonou, Bénin. Key references are highlighted in bold. Achidi, J-B, Bourguet, L, Elsaesser, R, Legier, A, Paulvé, E, et Triboullard, N. 2012. Cartes hydrogéologiques du Bénin au 1/500 000 and 1/200 000. GIZ Germany or DGEau Benin. Alassane, A. 2004. Etude hydrogéologique du Continental Terminal et des formations de la plaine littorale dans la région de Porto-Novo (sud du Bénin): identification des aquifères et vulnérabilité de la nappe superficielle. Thèse 3ème cycle, 145 pp. Université Cheik Anta Diop, Dakar, Sénégal. Barthel, R, Sonneveld, BGJS, Goetzinger, J, Keyzer, M A, Pande, S, Printz, A and Gaiser, T. 2009. Integrated assessment of groundwater resources in the Oueme basin, Benin, West Africa. Physics and Chemistry of the Earth, Parts A/B/C, 34(4-5), 236-250. Boukari, M. 1980. Contribution à l’étude hydrogéologique des régions de socle de l’Afrique occidentale : mise au point des connaissances relatives à la République Populaire du Bénin. Rapport Département de Géologie. No. 4. Nouvelle série. Mémoire de DEA, 141 p. Université de Dakar, Sénégal. Boukari, M. 1982. Contribution à l’étude hydrogéologique des régions de socle de l’Afrique intertropicale : l’hydrogéologie de la région de Dassa-Zoumé (Bénin). Thèse 3ème cycle, 140 p. Université Cheik Anta Diop, Dakar, Sénégal. Boukari, M. 1989. Etude de synthèse et de cartographie relative au cadre physique et aux ressources naturelles de la région nord du Bénin. Rapport SERHAU, 68 p. Cotonou, Bénin. Boukari, M. 1998. Fonctionnement du système aquifère exploité pour l’approvisionnement en eau de la ville de Cotonou sur le littoral béninois. Impact du développement urbain sur la qualité des ressources. Thèse de doctorat ès Sciences, 278 p. Université Cheik Anta Diop, Dakar Sénégal. Boukari, M. 2002. Réactualisation des connaissances hydrogéologiques relatives au bassin sédimentaire côtier du Bénin. Rapport du programme d’Appui à la Gestion des Ressources en Eau (AGRE), 134 p. Direction Hydraulique. Cotonou, Bénin. Boukari, M. 2007. Hydrogéologie de la République du Bénin (Afrique de l’ouest). Africa Geoscience Review , 14,(3),303–328. France. Boukari, M, et Alassane, A. 2007. Les ressources en eaux souterraines du bassin sédimentaire côtier de la République du Bénin. Africa Geoscience Review , 14,(III), 283–301. France. Boukari, M, Alidou, S, Oyédé, L M, Gaye, C B, et Maliki, R. 1995. Identification des aquifères de la area littorale du Bénin (Afrique de l'Ouest) : hydrodynamique, hydrochimie et problèmes d'alimentation en eau de la ville de Cotonou. African Geoscience Review, 2 (1), 139–157. Boukari, M, Gaye, C B, Faye, A, and Faye, S. 1996. 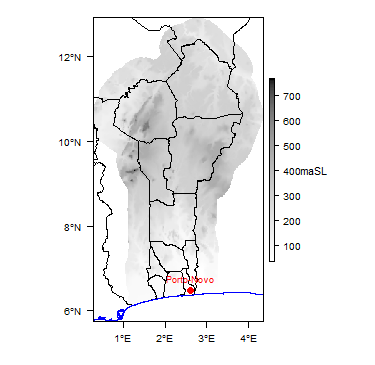 The impact of urban development on coastal aquifers near Cotonou (Bénin). Journal of African Earth Sciences, 22 (4), 403–408.Bouzid, M. 1971. Développement de l’utilisation des eaux souterraines, Dahomey : hydrogéologie. Rapport technique 1, 88 p. PNUD-FAO. SF/DAH3. Rome, Italie. BURGEAP-BRGM. 1986. Programme d’hydraulique villageoise du Nord-Borgou (Bénin). Etudes d’implantation et contrôle des travaux de points d’eau. Rapport final, 74 p. Direction de l’Hydraulique. Cotonou, Bénin. BURGEAP-BRGM. 1994. Projet d’alimentation en eau potable des areas lacustres des Départements de l’Atlantique et de l’Ouémé. Rapport final, 64 p. Direction de l’Hydraulique, Cotonou, Bénin. CEFIGRE (Centre de Formation Internationale à la Gestion des Ressources en Eau). 1984. Synthèse des connaissances sur l’hydrogéologie du socle cristallin et cristallophyllien, et du sédimentaire ancien de l’Afrique de l’Ouest. Rapport Ministère des Relations Extérieures. 121 p. Valbonne. France. Collin, J J, et Mangin, A. 1985. Evolution récente de l'hydrogéologie: de la prospection à la gestion des ressources en eau. Bulletin de la Société. Géologique de France. 7, 999–1008. Descloitres, M, Séguis, L, and Wubda, M. 2006. Caractérisation des aquifères sur les sites AMMA CATCH au Bénin, apport de la résonnance magnétique des protons. Rapport de mission. Direction de l’Hydraulique, Cotonou, Bénin. Dray, M, Giachello, L, Lazzarotto, V, Mancini, M, Roman, E, et Zuppi, G M. 1988. Etude isotopique de l’aquifère crétacé du bassin côtier béninois. Actes du Séminaire sur le développement des techniques isotopiques et nucléaires en hydrologie dans les pays du Sahel. Niamey, Niger. 21-35. Direction de l’Hydraulique. 2000. Vision Eau 2025 Bénin. Rapport 28 p.
El Fahem, T. 2008. Hydrogeological conceptualisation of a tropical river catchment in a crystalline basement area and transfer into a numerical groundwater model. Case study for the Upper Oueme catchment in Benin. PhD thesis, Université of Bonn, Germany. Engalenc, M. 1978a. Les modalités de la recherche d’eau dan les roches cristallines fracturées de l’Afrique de l’Ouest. Bull. CIEH, No. 33–34, 22–30. Engalenc, M. 1978b. Méthode d’étude et de recherche de l’eau souterraine des roches cristallines de l’Afrique de l’Ouest. Rapport CIEH, 318 p. Ouagadougou. Haute-Volta. Erah, P O and Akujieze, C N. 2002. The Quality of Groundwater in Benin City: A baseline study on inorganic chemicals and microbial contaminants of health importance in boreholes and open wells. Tropical Journal of Pharmaceutical Research, 1(2), 75-82. Falola E, et Sotognon, F C. 2002. Impact de l’utilisation des intrants agricoles sur la qualité Chimique des nappes d’eaux souterraines dans les Départements du Borgou et de l’Alibori. Mémoire de Maîtrise, 59 p. Université d’Abomey-Calavi, Bénin. GEOHYDRAULIQUE. 1985. 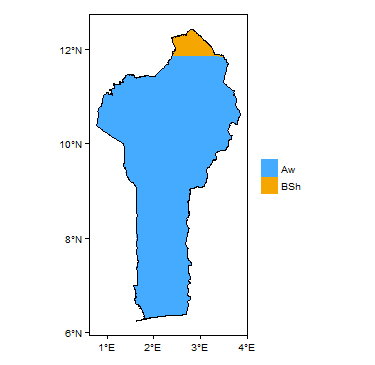 Note explicative de la carte hydrogéologique à 1:200 000 du bassin sédimentaire côtier du Bénin. Rapport, 23 p. Direction de l’Hydraulique, Cotonou, Bénin. GEOHYDRAULIQUE. 1985b. Hydraulique villageoise dans les provinces de l’Atacora, du Mono et de l’Ouémé. Rapport final, 236 p. 1. Direction de l’Hydraulique, Cotonou, Bénin. GEOHYDRAULIQUE-BURGEAP. 1988. Projet d’hydraulique villageoise de l’Atlantique et du Sud du Zou. Rapport final, 185 p. Direction de l’Hydraulique, Cotonou, Bénin. GIGG (Groupement IGIP-GKW-GRAS). 1983. Plan Directeur Alimentation en eau potable ville de Cotonou : les ressources en eau. 2 volumes. Rapport, Société Béninoise d’Electricité et d’Eau, Cotonou, Bénin. Gnaha, E F C, et Adjadji, Ch A. 2001. Evolution quantitative et qualitative des ressources en eaux souterraines captées dans le périmètre de pompage intensif de Godomey: impact sur l’approvisionnement en eau potable de l’agglomération de Cotonou. Mémoire Maîtrise, 53 p. Géologie Appliquée. Université Abomey-Calavi, Cotonou, Bénin. Guiraud, R. 1975. Eléments pour une orientation nouvelle de la recherche des eaux souterraines dans les régions à substratum métamorphique ou éruptif de l’Afrique Occidentale. Réunion de Porto-Alegre. Mémoire AIH, XI, 15–19. Guiraud, R. 1976. Sur la présence des nappes aquifères de fissures dans le socle précambrien de l’Afrique intertropicale. 4ème Réunion Annuelle des Sciences de la Terre. Société Géologique de France. Paris. Guiraud, R. 1988. L’hydrogéologie de l’Afrique. Journal of African Earth Sciences, 7, 519–543. Guiraud, R, et Alidou, S. 1981. La faille de Kandi (Bénin), témoin du rejeu fini-Crétacé d’un accident majeur à l’échelle de la plaque africaine. Comptes Rendus Académie des Sciences. Paris, France. 293 (II), 779–782. Guiraud, R, et Lenck, P. 1975. Sur l’intérêt hydrogéologique majeur des areas de faille dans le socle métamorphique et éruptif de l’Afrique Occidentale. Actes 8ème Réunion du Centre International Etude Hydraulique. Ouagadougou. Haute-Volta. Hector, B, Séguis, L, Hinderer, J, Descloitres, M, Vouillamoz, J-M, Wubda, M, Boy, J-P, Luck, B, et Moigne, N L. 2013. Gravity effect of water storage changes in a weathered in West Africa: results from joint absolute gravity, hydrological monitoring and geophysical prospection. Geophysical Journal International, 194, 737–750. http://dx.doi.org/10.1093/gji/ggt146. Houessou, A, et Lang, J. 1978. Contribution à l’étude du "Continental Terminal" dans le Bénin méridional. Bulletin des Sciences Géologiques, 31 (4), 137–149. Houessou, A, et Lang, J. 1979. La "Terre de Barre" dans le Bénin méridional (Afrique de l’Ouest). Bulletin ASEQUA 56–57, 49–58. IGIP-GKW-GRAS. 1989. Plans directeurs et études d'ingénierie pour l'alimentation en eau potable et l'évacuation des eaux pluviales, des eaux usées et déchets solides: ville de Cotonou. Rapport Société Béninoise d’Électricité et d’Eau, Cotonou, Bénin., 90 p.
INSAE ou Institut National de la Statistique te de l’Analyse Economique. 2003. Troisième recensement général de la population et de l'habitation, février 2002: synthèse des résultats. Rapport, 27 p. Direction des Etudes Démographiques MECCAG. Cotonou, Bénin. Kamagaté, B, Séguis, L, Favreau, G, Seidel, J-L, Descloitres, M, et Affaton, P. 2007. Processus et bilan des flux hydriques d’un bassin versant de milieu tropical de socle au Bénin (Donga, haut Ouémé). C.R. Geosci. 339, 418–429. http://dx.doi.org/10.1016/j.crte.2007.04.003. Lang, J, Kogbe, C, Alidou, S, Alzouma, K, Bellion, G, Duboi,s D, Houessou, A, et Trichet, J. 1986. Le sidérolithique du Tertiaire oust-africain et le concept du Continental Termial. Bulletin de la Société. Géologique de France. 8, (II) 605–622. Lang, J, Kogbe, C, Alidou, S, Alzouma, K, Bellion, G, Dubois, D, Durand, A, Guiraud, R, Houessou, A, de Klasz, I, Romann, E, Salard-Cheboldaeff, M, et Trichet, J. 1990. The Continental Terminal in Africa. Journal of African Earth Sciences, 10 (1/2), 79–99. Le Barbé, L, Alé, G, Millet, B, Borel, Y, et Gualde, R. 1993. Les ressources en eaux superficielles de la République du Bénin. 457 p. Collection Monographies hydrologiques ORSTOM. Paris, France. 11. Lelong, F. 1963. Nouvelles données sur les “nappes d’arène” à la suite d’une reconnaissance hydrogéologique du Centre-Nord Dahomey (région de Parakou et de Nikki). 37 p. Publ. Centre International d’Etude Hydraulique. Ouagadougou, Haute-Volta. Lelong, F. 1966. Régime des nappes phréatiques contenues dans les formations d’altération tropicale : conséquences pour la pédogenèse. Sciences de la Terre XI(2), 201–244. Maliki, R. 1993. Etude hydrogéologique du littoral béninois dans la région de Cotonou (AO). Thèse 3ème cycle, 162 p. Université Cheikh Anta Diop, Dakar, Sénégal. MMEH. 2005. Document de politique Nationale de l’Eau : la gouvernance de l’eau au service du développement du Bénin. Rapport, 19 p. MMEH, Cotonou, Bénin. Ninard, B, et Besançon, M. 1962. Etudes sur les eaux minérales du Dahomey. Rapport, 16 p. Laboratoire National du Ministère de la Santé Publique et de l’Académie de Médecine, Service de Contrôle des Eaux Minérales, Paris, France. NISSAKU. 1994. Projet pour l'exploitation des eaux souterraines du Bénin, phase III. Rapport final, 204 p. Direction de l’Hydraulique, Cotonou, Bénin. Pallas, P. 1988. Contribution à l'étude des ressources en eau souterraines du Bassin côtier du Bénin: confrontation ressources-besoins. Rapport, 29 p. Direction de l’Hydraulique, Cotonou, Bénin. Sagbo, M O. 2000. Pollution des nappes alimentant la ville de Cotonou en eau de consommation: vulnérabilité et urgence des mesures de protection des aquifères Mémoire de DESS, Université Nationale du Bénin, Cotonou. Bénin. 69 p.
SERHAU (Service d’Etude et de Recherche pour l’Habitat et l’Urbanisme). 1992. Atlas cartographique de la région nord du Bénin. Rapport, 54 p. MEHU. Cotonou, Bénin. SGI (Société Générale pour Industrie). 1981. Etude de la nappe aquifère de Godomey. Rapport, 45 p. Société Béninoise d’Électricité et d’Eau, Cotonou, Bénin. 1/2. Slansky, M. 1962. Contribution à l'étude géologique du Bassin sédimentaire côtier du Dahomey et du Togo. Thèse 241 p. Université de Nancy, Nancy, France. SOGREAH/SCET-Tunisie. 1998. Etude de la stratégie nationale de gestion des ressources en eau du Bénin: assistance à la définition de la stratégie nationale de gestion des ressources en eau du Bénin. 7 volumes. Rapport final, Ministère des Mines, de l’Energie et de l’Hydraulique, Cotonou, Bénin. Totin, H. S., Amoussou, ERNEST, Odoulami, LÉOCADIE, Edorh, P A. Boukari M and Boko, M. 2013. Groundwater pollution and the safe water supply challenge in Cotonou town, Benin (West Africa). Proceedings of H, 4, 191-196. Totin, V S H. 2010. Sensibilité des eaux souterraines du bassin sédimentaire côtier du Bénin à l’évolution du climat et aux modes d’exploitation : Stratégies de gestion durable. Thèse de Doctorat, Université d’Abomey-Calavi, Cotonou, Bénin, 283 p.
Totin, V H S. 2003. Changements climatiques et vulnérabilité des ressources en eau sur le plateau d’Allada : approche prospective. Mémoire de Maîtrise, Université d’Abomey-Calavi, Bénin, Cotonou, Bénin, 101 p.
Turkpak International-SCET-Tunisie. 1991. Inventaire des ressources en eaux souterraines au Bénin. Rapport final, Direction de l’Hydraulique, Cotonou, Bénin. 1. 284 p.
United Nations (UN). 1990. Plan directeur d’utilisation des ressources en eau du Bénin. Rapport 51 p. PNUD, Projet BEN 85/004, Cotonou, Bénin. Vouillamoz, J M, Lawson, F M A, Yalo, N, et Descloitres, M. 2014. Groundwater in hard rocks of Benin: Regional storage and buffer capacity in the face of change. Journal of Hydrology. http://dx.doi.org/10.1016/j.jhydrol.2014.11.024. WAKUTI. 1968. Reconnaissance géophysique et sondages mécaniques dans le Centre, Nord-Est et Nord-Ouest du Dahomey. Rapport Direction Hydraulique, Mines et Travaux Publics. Cotonou, Bénin. Zevounou C, Alassane A, Kaki C, Bacharou T and Koudemekpo J. 2017. Piezometry of the Aquifer of the Continental Terminal in the Borehole Fields of Godomey and Ouedo for the Delimitation of the Protection Areas around Boreholes of Ouedo. Scientific Research 7(12), 1786-1800. ojg.2017.712120. Zimé Mora, B M, et Mondja Chabi, T-K. 2006. Analyses statistiques des données hydrochimiques dans les régions de socle et de couvertures anciennes du Bénin : intérêt pour la compréhension des processus de minéralisation des eaux souterraines de ces régions. Mémoire de Maîtrise, 63 p. Université d’Abomey-Calavi. Bénin. This page was last modified on 18 February 2019, at 11:20.